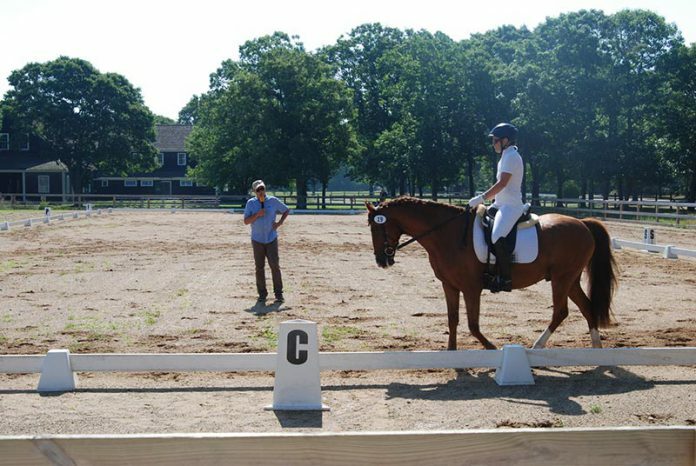 The Martha’s Vineyard Horse Council (MVHC) held a dressage event, “Ride, Critique, Ride,” on Saturday at the Ag Hall in West Tisbury that was educational for both riders and dressage-minded audience members. It was a first for the group. “We wanted to try out a new layout to stimulate more riders,” MVHC vice president Tracey Olsen said. Twelve equestrians registered to take part, hoping to come away with insights to improve their performance in the dressage ring. Dressage is originally a French term meaning “training,” and its purpose is to develop the horse’s natural athletic ability and willingness to work, making him calm, supple, and attentive to his rider. Competitive dressage involves nine progressive levels, incorporating multiple tests within each level. Each rider was allotted 30 minutes to ride her choice of test (a series of prescribed movements ridden inside a dressage ring) in front of a dressage judge, receive direct feedback and some instruction on how to improve, then a chance to perform the test a second time, utilizing the new insights. Feedback from a highly trained dressage expert can be an invaluable tool for a rider looking to improve in the sport. Keith Angstadt, who owns Bradford Equestrian Center in Haverhill, traveled to the Island to serve as judge. Mr. Angstadt, a rated dressage judge with 40 years of experience and several national and regional titles, is a familiar presence on the Island, having worked with Vineyard equestrians for many years. Ms. Olsen said that “Keith was the judge of choice” for the event. Mr. Angstadt spoke into a microphone as he watched each horse and rider, giving everyone in the crowd the unusual opportunity to listen in on his subtle observations, both during the tests and during the mini-lesson. Known as auditing, listening in on a lesson can yield helpful insight for a rider, even from the ground. “Inattentive, needs more energy,” he commented on one horse. “Could stretch longer,” to another. One young rider was encouraged to be more assertive with her mount. “Remember, you’re in charge,” he told her. A ripple of applause greeted each rider at the end of her time in the ring. The Martha’s Vineyard Horse Council strives to bring together horse lovers on Martha’s Vineyard, to promote horses and their related activities, and to provide educational clinics, seminars and youth programs for the local equine-loving community, according to its mission statement. For more information, go to mvhorsecouncil.com.